WEN has been making tools since 1951; known for creating high-quality tools at an affordable price. So, it shouldn’t be surprising that the WEN electric chainsaw (WEN 4017) is very affordable. It’s designed for homeowners who need a cheap chainsaw that can reliably handle small cutting jobs around the home. To give you some options, we also review several other chainsaws for you to compare and consider. Have you been thinking about getting a chainsaw for work around the yard or cutting firewood from fallen trees but have been put off by the price of gas chainsaws? Then this review is just for you. For well under a hundred dollars, you can get a powerful chainsaw that will make felling trees and other chainsaw tasks an absolute breeze. An electric chainsaw has its limitations. There is the fact that you are using an electric cord, so if you’re working more than 100ft from an electrical socket – it probably won’t be your best choice. They are not always as powerful as heavier gas chainsaws but then again, most home users don’t need all that power. For the cost, an electric chainsaw is ideal for most of us who only need to clear up trees and shrubs around our gardens. We’ll take a look at the Brand new Wen Electric Chainsaw, the Wen 4017 and look at a few others in this price range. We’ll also take a look at some affordable battery-powered options as well as the Makita UC4051A, which is more expensive and is a more professional chainsaw. With this wide selection, you’ll easily be able to make a decision on a great electric chainsaw that meets your needs. Excellent value. Great for pruning tasks. ✓ TIP : If you love WEN (as I do) but want a more powerful chainsaw then I recommend looking at the WEN 40417 40V Max — Yes, it’s 40V workhorse which costs a little more but well worth the money. For more details, scroll down and learn more. 12 amp motor powers the Oregon chain up to 44 feet per second. Lightweight design makes it easy to work for hours. Auto-oiling system lubricates itself to keep the chainsaw running efficiently. Tool-free chain system allows you to quickly remove your chain. Clean power. Quiet. No fumes. Cable strain relief notch helps wrangle extension cords. ✓ View or download the MANUAL for the WEN 4017. Firstly, let’s see how the WEN chainsaw measures up in terms of power. The 12A electric motor is the ultimate size for an electric chainsaw. It provides the maximum power that you can get without using a large gauge extension cord – the perfect balance of power and practicality. At 120V, the 12A motor gives you 1.44KW, resulting in 2.2Nm (1.62Lb Ft) of torque which will run the chain at 44 Ft per second. For a saw that weighs only 10Lbs, this is an amazing power to weight rate ratio. It’s a chainsaw that is light and easy to handle with ample power to drive the 16” chain with a double guard bar. It is as easy to use as a chainsaw can possibly be with a tool-free chain tensioning system. A large round knob on the side of the saw makes it incredibly quick and simple to replace or tension the chain. Adding to the ease of use is a self-lubricating chain. 16” is a great length for most home users and you should be able to cut through large tree stumps and branches with ease. A double guard bar and large well-positioned chain guard offer you really great safety from a user’s perspective. The cord clip on the handle makes it much easier and safer. This helps to prevent the cord from tangling and eliminates unwanted tension on the cord that could cause damage or result in the plug becoming disconnected. The 0.05” gauge chain has 57 drive links and a pitch of ⅜”. The chain and bar are Oregon, which is used on most high-grade chainsaws. Many regard them as the best. Even people who have been using gas chainsaws for many years have been very positive about the WEN4017 chainsaw. It’s a brand new product and I’m sure that many will begin to appreciate the value in this chainsaw that is both powerful and very affordable. It’s a durable item with a 2-year warranty. Never operate the saw above shoulder height. Includes a 4Ah Battery and Charger. An excellent chainsaw for the money. Very affordable. You won’t be disappointed. This 40V WEN chainsaw is worth the extra money. It’s a big step up from the WEN 4017. Personally, it’s good to have extra power when purchasing a chainsaw, especially when it comes to battery powered chainsaws. I’m not sure how WEN does it, but they consistently create products that are well-made, have lots of practical features and yet they make all of their products very affordable. I applaud them for that. They are a brand that consumers love. They produce products that satisfy the majority of homeowners. This WEN chainsaw isn’t as good as a Husqvarna or Makita so don’t expect it to fell a 30″ tree but let’s be honest, most homeowners don’t do that. As an everyday chainsaw this is an excellent 40V battery-powered chainsaw that I wholeheartedly recommend. As far as value goes, this WORX chainsaw is as good as it gets. Worx garden tools are very popular among homeowners as they are both affordable and dependable. The Worx WG303.1 is a very powerful 16” electric chainsaw. It has a 14.5A (1740W) motor, this gives you a bit more power than the WEN chainsaw which has the same length chain and bar. When working with longer extension cords you’ll need to check if the gauge can handle the higher current. The auto tensioning chain system is a patented design and will keep the chain correctly tensioned for longer and prevents over-tightening of the chain. This is quite unique and many of you may find this to be extremely useful. The low-kickback bar and electric chain brake provide excellent safety along with the chain guard which has a good sturdy design – the chain brake operates by pushing the guard forward. As with most modern chainsaws, you have the convenience of a self-lubricating chain. The Worx WG304.1 is exactly the same machine, just larger. This model has an 18” chain and bar, using a 15A (1 800W) motor. What’s really great about this larger model is that it hardly weighs any more than the smaller one. The Worx WG 303.1 weighs 11Lbs and the 304.1 weighs 11.3LBS. The soft-grip handles are the same on both saws and make it pretty easy to haul this weight around. Both these chainsaws offer really good power with good cutting capabilities. They come with the Worx 3-year warranty that has very reasonable terms. Learn more by reading our comprehensive article on these WORX Chainsaws. Electric chainsaws eliminate the need to mix oil and gas. 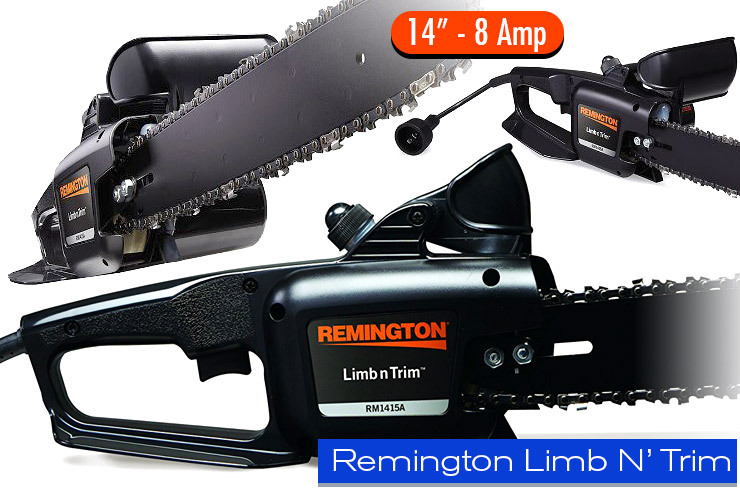 ✓ View or download the MANUAL for the Remington RM1425 Limb N’ Trim. The Remington is perfect for small to medium cutting tasks. It’s not as powerful as the WEN or Worx chainsaws – 8A for the Remington as opposed to 10A for the WEN chainsaw and 14.5 – 15A for the Worx models. It also has a shorter chain and bar, 14”. It is, however, somewhat cheaper. So if you’re not going to work it as hard, you may want to save a few bucks and buy the smaller Remington. It also weighs quite a bit less at 6.25Lbs, which makes it even easier to handle. A very basic chainsaw. Don’t expect too much. It’s quite basic, with none of the more advanced features that you find on most modern chainsaws. The low-kickback chain is not self-lubricating, so you have to lubricate the chain with a push button. This isn’t too difficult and the button is well positioned for easy operation using your thumb. You just have to remember to keep the chain lubricated while you work. Chain tensioning is still done the old-fashioned way with two bolts at the top of the bar. The tensioning bolts are well-positioned to make it easy but you will need to use a wrench. The chain guard is quite small, but wraps neatly around the front handle and looks perfectly safe. The guard is solid and will not obstruct your line of sight due to its very compact design. A very nicely priced chainsaw with a distinct weight advantage that makes it easy to use for just about anyone. As for quality, it seems very robust and the simple technology means there is very little to go wrong. The Remington Limb N Trim comes with a 2-year warranty. Using a battery chainsaw has the advantage of not needing a power cord. This is great for larger yards where you simply can’t reach all the trees using an extension cord. Battery chainsaws are more expensive, so many avoid them for this reason. If you want to take advantage of the benefits of battery, but don’t want to spend too much, there are some options available. We’re going to review two battery chainsaws that offer great quality at an affordable price. Improved auto oiling system with a primer button. ✓ View or download the MANUAL for the Black and Decker LCS1020. This is a wonderfully light and compact chainsaw that generally retails for under $100. It’s not the best for large trees as it only has a 10” chain and bar. The compact size and weight of 7.2Lbs is beneficial for people who don’t want to handle a large heavy machine. The Oregon bar and chain offers the best in robust dependability and the chain is self-lubricating, though, you do need to prime the oil system with a push button to get it started. It has a large window for checking the oil level. You also have the advantage of a tool-less chain tensioning setup that works in the same way as the WEN with a large knob on the side of the saw. Get the LCS1240 if you want automatic chain oiling. The 20V 2AH battery is a vast improvement on their older batteries and stays charged for about five times longer. Black and Decker claim up to 150 cuts on a single battery charge but this will depend very much on the thickness and hardness of the wood that you’re cutting. You’ll probably find that you’ll get a lot less time from the battery with normal use. If you want to work for longer periods, it would be a good idea to get a second battery. The chain guard is wide and well designed, as with the handles that give you very easy and safe operation. The low-Kickback chain design also adds to the safety of the saw. You get the standard Black and Decker 2-year warranty which should give most buyers a feeling of confidence in the product’s quality and dependability. Black and Decker are known for providing quality tools at an affordable price. It’s a great little chainsaw for people who don’t have to cut larger trees and it is very easy to use. Automatic oiling system is worth the extra cost. ✓ View or download the MANUAL for the Black and Decker LCS1240. If you want a larger battery chainsaw, you’ll need to fork out quite a bit more cash. The Black and Decker LCS1240 is one of the best priced 12” battery chainsaws that still offers good quality and a robust design. It looks very much like the smaller Black and Decker LCS1020, only larger. It has the same low-kickback Oregon chain and bar, with a larger cutting capacity of 12”. The chain tensioning and self-lubrication systems are also exactly the same. Being a larger chainsaw, it obviously weighs more, 10.4 Lbs. It has a larger more powerful motor to provide the power needed for the larger cutting abilities of this saw. 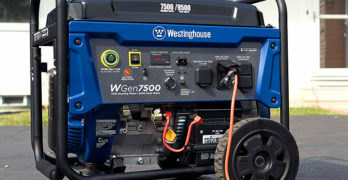 It comes with a 40V 2AH battery. The advantage of this battery is that it used in all the larger Black and Decker garden tools, which includes a lawnmower, string cutter, hedge trimmer and a powerful leaf blower. This is a powerful chainsaw capable of meeting the challenges of most garden needs and it comes with a 3-year warranty for even greater peace of mind. Now, if you want to go the whole hog and get something that matches any of the top professional chainsaws and still have the advantages of electric operation, we have the perfect solution for that too. ✓ View or download the MANUAL or BROCHURE for the Makita UC4051A. There’s little need to explain the benefits of buying a Makita product. For years they have been giving us state of the art high-end technology that has proven itself time and again. The Makita UC4051A is large enough to compete with the best and has a 16” chain and bar. When it comes to cutting through serious hardwood, the Makita has the power to do it at a speed of 2 900ft/min. Of course, with the extra power and bar length comes some extra weight – it weighs 12.3Lbs without the bar and chain. So the total weight of the machine when you’re using will be close to 15Lbs. Metal components are the sign of a great chainsaw. The Makita gearbox design is one of the best and gives a really smooth startup as soon as you touch the power trigger. It has all the safety features that one can expect from a chainsaw with a well-designed chain guard, an electric chain brake, and a current limiter to prevent burnout when the saw is jammed. It also has all the convenience that is common on the better chainsaws. The chain is self-lubricating with an easy to view window for checking the oil level. No tools are needed to replace or tension the chain and this done with a strong and easy to use tighten knob close to the bar. The rubberized handles are incredibly sturdy, well positioned and make the saw comfortable to use. As good as a light-duty gas chainsaw. It won’t let you down. This is a tool of the highest quality standards with the power and bar length to compare with any professional gas chainsaw. When you buy the Makita UC4051A you get a 1-year warranty and a 30-day replacement of refund guarantee. It is Makita and for this reason, you can be assured of a robust design for hard working conditions and, of course, you’re going to pay more for this. The Makita is considerably more expensive than the cheaper models that we’ve reviewed earlier but it is in an altogether different class. Learn more by reading our comprehensive review of the Makita UC4051A (16″) and Makita UC3551A (14″) chainsaws. Easy to use. An electric chainsaw starts with the touch of a button. There’s no tugging on a recoil starter to get going. No gas, oil or fumes. With gas chainsaws, you always have to keep gas and oil. You also have to mix the gas and oil at the correct ratio every time you fill the tank and electric power eliminates this hassle. You won’t have to deal with the fumes and unpleasant odor emitted from the gas engine and stored fuel. Low noise. Electric motors run much quieter than gas engines. This is easier on your ears while you’re working and your neighbors aren’t going to be complaining about noise every time you use the chainsaw. Low maintenance. Gas engines require regular maintenance and the air filter needs to be checked and cleaned continuously. With an electric chainsaw, you only need to ensure that the chain remains lubricated and is kept clean. Self-lubricating chainsaws make this even easier. Electric chainsaws are cheaper to buy and you save on maintenance costs. A much safer way to cut wood under 4-inches. Blade and chain retract until they’re fully enclosed in the guard, protecting users from dangerous contact. JawSaw is the only chainsaw designed to operate directly on the ground or pavement. Automatic chain oiler with oil level indicator helps extend the life of your bar and chain, Patented auto-tension system sets the proper tension for you. Bar length is 6” and provides a max cutting diameter of 4”, weighs only 8.1 lbs. Whenever you use an electric chainsaw, you’ll need to use an extension cord. Apart from the regular safety concerns like not working in wet conditions and checking that the cord is not damaged, you have to look at the length of cord that you’re using. Chances are, you’ll be working some distance from the power socket and for this, you’ll need a reasonably long extension cord. The gauge of the wire inside the cord determines the length of cord that is safe to use. A longer distance will require a thicker gauge to compensate for the resistance created by the extra length. Make sure that the extension cord that you’re using has an amp rating that is sufficient to meet that of the saw. If you need extra length, you may be using more than one extension cord, remember that the extra length reduces the current (amps) that the cord can safely accommodate. If you’re using a 50ft cord that is rated for 15A and add another cord of the same length and current rating, you’ll effectively be halving the current load that you can use. Two 15A 50ft cords (providing 100 ft.) can only be safely used for a maximum rating of 7.5A. If you overload the current on a cord it will generate additional heat, as you use the cord it will become increasingly hotter and will eventually burn through the insulation, causing a short circuit. This can also be a fire hazard. Read our Outdoor Extension Cord Buying Guide. With any chainsaw, the speed at which you cut through wood is determined by the RPM of the chain. Electric chainsaws are often less powerful than gas models. If you try to work faster by applying more force to the blade, it will encounter more resistance and will, at some point jam and get stuck. Always work at a pace that matches the power of the saw and remember that cutting through harder wood will take longer. UV hard hat, 6-pt suspension, 25 dB NRR ear protectors, face screen & rain neck gear. Most chainsaw accidents are as result of the chain coming loose and flying toward the user. The chain guard is there to protect you from this but it’s better to be safe than sorry. Check the chain tension regularly. If the chain is too slack, it will come loose and can cause severe injury. A chain that is tensioned too tightly will snap and also be dangerous. So make sure that you always tension the chain correctly. One should always wear eye protection and use heavy duty leather gloves when using a chainsaw. Fortunately, electric chainsaws don’t require much maintenance but there are a few things that will keep the saw working better for longer. Chain lubrication is very important so make sure that there is always oil in the reservoir. Use the correct oil, the owner’s manual will specify what grade of oil is to be used to lubricate the chain. Sawdust and wood chips can collect on the chain. Regularly remove any dirt from the chain.